We’ve had “management training” courses the last two days at my office. These classes consist of me and half a dozen other managers/supervisors hanging out in a conference room eating candy, playing with toys, occasionally watching videos and talking about how to be better at our jobs. The important thing here is the candy. (Obviously). But I do have to say spotting a Martin Sheen lookalike in one of the training videos was cool. It turned out to be Martin Sheen’s brother. I’m not a huge candyholic or anything. I mean, I like specifically what I like and that’s it. (Usually dark chocolate, and especially See’s. Just FYI since, you know, ’tis the season). Wink. 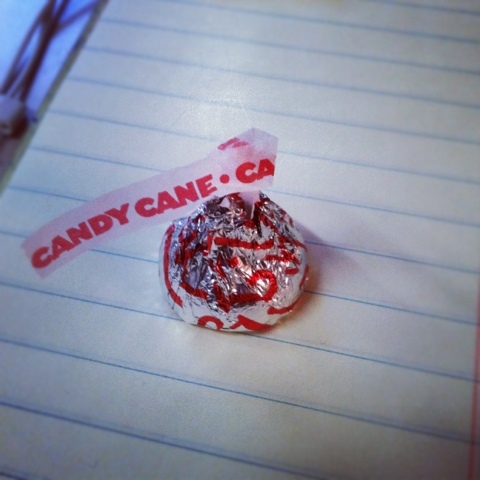 But yesterday the instructor (a totally sweet and knowledgeable gal named Karen) dumped a bag of peppermint candy cane kisses on the table. I was unperturbed. I don’t even like white chocolate. (It’s not REAL chocolate, you know). But the other people around me started trying them and flipping out. So I thought what the hay and I tried one. That was the beginning of the end. Crunchy and smooth. Minty and chocolatey. Perfect combo.